my day: go to work, come home for lunch, go back to work, get a text from the husband saying get off early so we can start the freaking weekend.... so i finish up and i just left. haha!!! i didnt even ask.... i dont ever have anything to do, so i dont see why i had to stay.... come home, we get on our bikes and went for a ride. 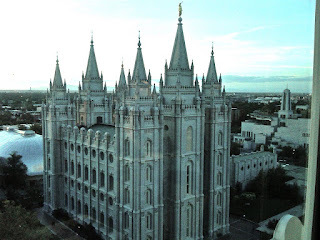 ate dinner at the roof on temple square... the sunset was pretty bomb... the temple was great... and i ate like 4 rolls, at least 4 diet cokes... and did you know it is a buffet?? well... i sure didnt. lets just say it's the weekend and calories dont count. plus, i have already gained some lbs since becoming the mrs's... o my. it needs to STOP!!! here is our view... we rode our bikes home... now we are going to watch a movie. what a great friday date with the husband right?? YES!!! it is the WEEKEND!!! live it up!! you're weird and nuts but I still miss you and this.